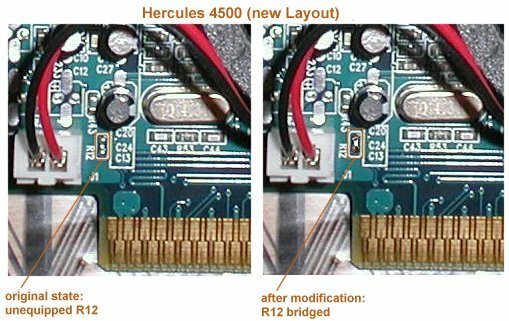 In the following article we describe how to modify a Hercules 3D Prophet 4500 AGP (which in it’s original state is AGP 2x only) to support the faster and maybe more compatible (with new motherboards) AGP 4x mode. The modification aims at the more experienced users as it requires hardware modifications. First of all we’d like to say that we can not be held responsible for damaged hard- or software occurring during the modification process, you do this on your own risk. The manufacturer’s warranty will be lost during the process too. 1.) For whom is this modification recommended? For those who would like to squeeze some more performance out of the board (app. 0-2%). For whom is this modification not recommended? User with few or no knowledge towards hardware and bios flashing. User who’d like to see big performance improvements. 2.) Theory, how does the modification work? Via AGP pin A2 the motherboard checks the card’s AGP capabilities. In case pin A2 is open, as it is on our Hercules 4500 in it’s original state, the motherboard will recognize an AGP 1/2x board with a signal voltage of 1.5 or 3.3V. If pin A2 is grounded then the motherboard detects an AGP 4x capable board which definitely supports the signal voltage of 1.5V. As we know the Kyro 2 comes with a signal voltage of 1.5V we thus just need to ground pin A2 and the mainboard will work together with the Kyro 2 in AGP 4x mode. The Hercules 4500’s BIOS is just like any other Kyro 2’s BIOS software locked to AGP 2x. The result is a limitation to a max of AGP 2x though the card is on the hardware side compatible with AGP 4x. Via BIOS-editor software one can remove that limitation. With an unofficial tool this is possible on Kyro 2s too. Once the modified BIOS is flashed into the board AGP 4x can be activated. Depending on the layout version of your card you must bridge either R168(old layout) or R12(new layout). 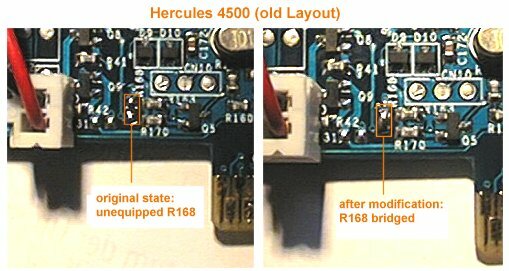 Those two unequipped solder pads (tin surfaces) can be found about 1cm to the right from the fan plug and are arranged vertically. For us the vertically aligned unequipped R168 or R12 is interesting. The lower solder pad is connected to the AGP pin A2 the upper one with ground. After soldering both solder pads are bridged thus AGP pin A2 is grounded and indicates AGP 4x capabilities to the motherboard. One definitely has to do tidy work as both resistors especially near R168 should not be bridged. After executing one is asked to secure the current BIOS. After that backup one just quits the installation. Flashing this file must be done under pure DOS so the best would be to extract the files onto a boot disk. After booting from that disk start „update.bat“ and follow the instructions on the screen. After a successfully accomplished flash reboot and check the AGP mode (i.e. with SiSoftSandra, AIDA32, WCPUID). In case the transfer mode still shows 2x try reinstalling the drivers again (with a previous deinstallation).